Ian Anderson's Caves Branch Jungle Lodge is located at just 20 minutes from Belmopan, the Capital of Belize and one hour and 20 minutes from San Ignacio in the Cayo District and one and a half hour from Belize City to the north and from Dangriga to the south. The Caves Branch Jungle Lodge is recommended for travelers who are not looking for the comfort of a five star hotel, but for adventure, jungle and nature! This jungle lodge is overlooking the Caves Branch River and is in walking distance from Saint Herman's Blue Hole National Park. Every accommodation at Caves Branch Jungle Lodge provides the experience of enjoying the sights and sounds of the surrounding jungle and nearby river. 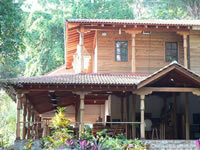 Available are Jungle Tree Houses and Suites, Jungle bungalows and Jungle Cabanas. All rooms feature private bathrooms, ceiling fans and are completely screened. Jungle Tree Houses have king beds and living area with a day twin bed and trundle twin bed. Jungle bungalows feature queen beds and a living room with a futon.